Congratulations to "Trude V." and "Laura", the winners in Susanne's giveaway. Thank you to all who participated! Hello again, and thank you so much for letting me come and visit like this. Please leave a comment for your chance to win an e-copy of Desert Deception, available November 1, 2016. 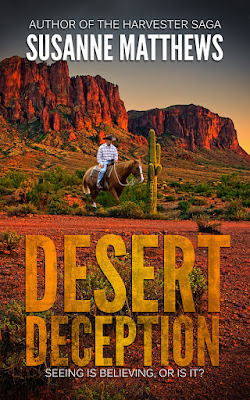 Desert Deception is my eleventh romantic suspense novel, but unlike the other ten books I’ve written in this genre, I didn’t start this one from scratch. A couple of years ago, I co-wrote contemporary romance novels with another author under the penname Misty Matthews. It seems that as great a writing team as we were, the odds were against us, and when both of the publishers we’d worked with called it quits, one far more nicely and honestly than the other, Misty and I dissolved our writing association, and divided the spoils between us. She got one finished manuscript that had done well for us, and one partial; I got Coming Home, Book One of Taking a Chance on Love series, a series that was never completed. When we’d started the series, we intended to write happily ever afters for five characters, dropping hints throughout each book in the series that things might not be as nice and cozy in Chance as they appeared. Now, had I wanted to, I could’ve given the book a new cover, and released it as it was under my name, but I’d had aspirations for that series, and decided to rewrite the book, keeping some of the original ideas which I loved and developing the mystery I’d anticipated around it. Sounds simple enough, right? WRONG! Turning a planned series into one book is tough, but doing it with a contemporary romance and changing it into a suspense novel is hard work. Add to that my decision to give it a more western flavor … well, let’s just say the book took twists and turns even I hadn’t anticipated. When high-powered Santa Fe attorney Casey Stevens reluctantly returns to Fortune for Gold Rush Days, she is drawn to Cole Walker Junior, but he is no longer the shy, quiet boy she recalls. Then again, Cole isn’t the only one who has changed. The town may be celebrating its past, but someone is trying to destroy its future. A hit and run accident leaves Fortune’s only lawyer in a coma, forcing Casey to choose between helping innocent people and running away once more. Can she face the demons of her past or will they destroy her this time? Cole Warner has a secret identity, one he’s determined to protect at all costs. The police officer, volunteer firefighter, and part-time store owner, is also popular western novelist, CJ Coleson, who uses Fortune and its people as the inspiration for his books. Having Casey walk into his life turns it upside down. When someone starts using the murders in Cole’s books to stage a killing spree of their own, keeping his secret may be too costly, but admitting the truth could ruin any chance they have for a happily ever after. I can hear you asking: “what did you change?” Well … how about the names of all of the characters, the location of the story, and most of the plot. It’s easier to ask: “what did you keep?” Her occupation and his secret identity as an author. I kept a few scenes I liked from the beginning, middle, and end. I took a 70,000 word story, cut at least 40,000 words from it, and created a 130,000 word mystery instead—one I hope you’ll enjoy as much as I enjoyed writing it. That’s right. I decided to focus my story on greed. The Superstition Mountains are home to many legends and myths—everything from Apache thunder gods, angry spirits that make men vanish—or just separate their heads from their bodies—and lost gold mines. Lost in the area are the Lost Dutchman mine, Coronado’s seven cities of gold named Cibola, and the Peralta mine, a rich strike that ended with a massacre at the hands of those who believed their mountains were sacred. So many juicy possibilities. You’ll have to read the book to see how I combined everything into the perfect suspense story. To find out more about my writing and where you can purchase my books, please visit my website. Thanks so much for letting me visit JRS. Susanne will be awarding an e book copy of DESERT DECEPTION to two lucky readers leaving a comment or email entry. This sounds like quite an endeavor, but obviously a work of love. Romantic suspense is my favorite kind of book. I would love to win a copy. Thanks for the chance. I hope you enjoy the Harvester Saga. It sounds like this book was a challenge for you to work out. But the good news is that it sounds very interesting. I am adding it to my TBR list. I have also added several of your books to my list. Desert Deception will be available November 11th. It sounds like it's almost harder to rework this then to start something fresh! But it seems like it turned out!